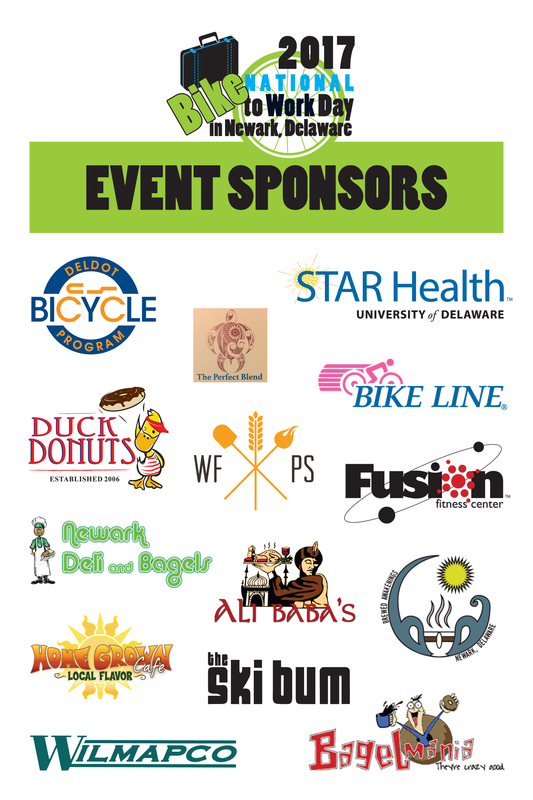 Newark’s celebration of National Bike to Work Day, by all estimates, was a big success, drawing nearly 120 riders to Mentors’ Circle on the University of Delaware campus for the early morning event. The warm, sunny weather definitely helped increase the participation in this event from previous years, as did the great support in terms of sponsorship from the business community, which furnished the food and prizes for the random giveaways. Several of the featured speakers rode in, each with one of several area “bike trains.” The largest and most impressive bike train was that of Bloom Energy. As University of Delaware Provost Domenico Grasso was beginning to officially welcome everyone, a group of 30+ riders from Bloom arrived, making their corporate presence known with team T-shirts. The morning featured wonderfully encouraging bicycle-centric messages from New Castle County Executive Matt Meyer, state Sen. Dave Sokola, state Rep. Paul Baumbach, state Rep. Ed Osienski, and retiring Newark City Manager Carol Houck. Event coordinator Mike Fortner (left) and BikeNewark chair Mark Deshon (right) presented the 2017 Bicycle Friendly Community Leader Award to former Gov. Jack Markell. Markell’s mother, Leni, and children, Michael (with award) and Molly, accepted the award on his behalf. 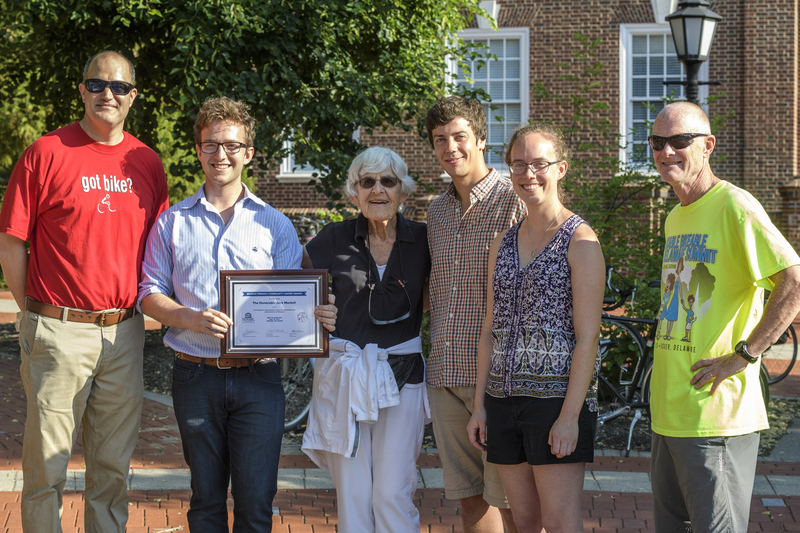 The City of Newark and BikeNewark presented the annual Bicycle Friendly Community Leader Award to former Gov. Jack Markell. Markell was in Italy on a bicycle trip, so his mother and children were there to accept the award on his behalf. Son Michael spoke glowingly about the influence his dad has had on him in terms of bicycling and giving back to the community. A large group photo was organized, and then event coordinator Mike Fortner, one of BikeNewark’s liaisons from the City of Newark, made the morning especially happy for many who had stayed for the random giveaways as a formal conclusion to the morning’s festivities. 2018’s Bike to Work Day event in Newark will take place on Friday, May 18. BikeNewark looks forward to seeing you there.